Provide many experiences that develop fine motor skills – playdough, threading, building etc. Make sure your child is using the correct pencil grip – get a moulded pencil grip if necessary. Teach the correct letter formation – bad habits are hard to undo. Avoid have-a-go methods where the child is internalising incorrect letter combinations that will need to re-learnt later. Do not be afraid to tell children how to spell a word. It is better to copy from a good model than to write the word the wrong way over and over again. You can encourage them to use their phonetic knowledge and spelling rules as you work with them to write the word correctly the first time. The child chooses their topic for the day and spends a few minutes drawing a picture. Have them dictate a sentence about the picture for you to write down, leaving every second line blank. Ask questions as you do this; What does the word start with? How do I write the letter “s”? Show me in the air. What sound can you hear in the middle of the word? How do I write a “ch” sound? This is one of your sight words – can you remember which letters go together to say “the”? For beginners, re-write the sentence onto a separate strip of paper. Cut it into individual words (or have them do that) then ask them to match these words underneath the ones you have written in their book and glue them in. When this is easy, have the child trace some of the words you have written. For one of my preschoolers I choose a couple of words each day to write in dots so that he can trace them to write the word. Read back the writing together, pointing to each word as you do so. Ask them to find a word for you – Can you see the word that says “house”? Move on to having the child write their own sentence once they have a large enough bank of words to do so. 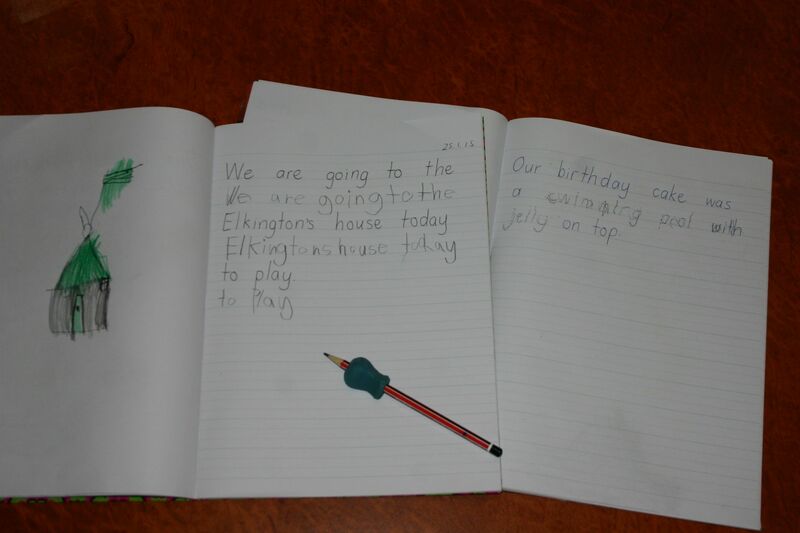 Brainstorm words they may need before starting and write them along the bottom of the page so that they can see the correct spelling as they write the word for themselves. Correct any errors as soon as possible. Obviously there is a lot more to learning to write than I have covered here but for the sake of clarity I have tried to keep it brief. I have used diary writing with several classes of students and now my own children and it is encouraging for them to watch their skills develop over time, as well as proving a lovely keepsake for later. A few years ago my Mum pulled out a school diary I had written in year one and it was so cool to read through and see what was important in my life at the time. It began with the teacher writing everything and by the end of the book I was writing everything – all in the space of one year. Preschoolers will of course move more slowly than this but you will be surprised at their progress. Reading though my diary bought back some wonderful memories of events that I had totally forgotten about and made us all laugh to see what Mum did when she was in school. Thanks Ang! We’ve just started our diary writing as you suggested and this post is very helpful to see how to transition over the course of the year!